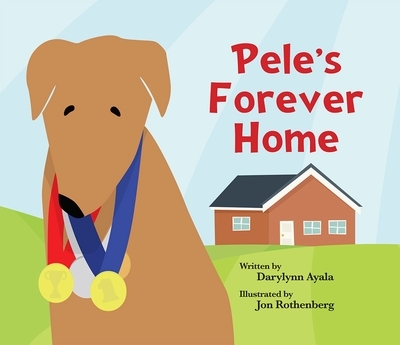 Pele's Forever Home is a true story about a champion greyhound named Pele, who started racing professionally at age two and was retired at age five. Pele won 20 of the 114 races he ran in his lifetime. When he was six years old, he was adopted by Jessica and Paul, who lived in Boston, Massachusetts. Pele was more than just an athlete. He was an amazing dog, full of personality and love. He found his "Forever Home" in a family that loved him tremendously. Sadly, Pele passed away when he was just shy of ten years old. He is truly missed. Darylynn Ayala is an accomplished accessory designer, sculptor and published author who resides in New York City. She is a strong supporter of greyhound adoptions and a passionate member of the board of Blessings in a Backpack. Proceeds from the sales of her first book, Pele's Forever Home, will support both missions. Jon Rothenberg is an illustrator living in St. Louis. He received his Bachelor of Fine Arts degree from Washington University.